Temperature : Max. 37°C and Min. 23°C in Summer. Max. 29°C and Min. 9°C in Winter. Lying on the main Delhi-Mumbai railway line. Sawai Madhopur is the gateway to the world-renowned Ranthambhor National Park. Ranthambhor has been a witness to the rise and fall of many rulers and a series of battle scenes. In the 13th century A.D., Govinda, the grandson of Prithviraj Chauhan took over the reign of the land. Later his succeessor Vagbhatta, beautiful the city and built a noteworthy temple at Jhain. In the middle of the 15th century A.D., Rana Kumbha captured the fort and gifted it to his son to be occupied later by the Hada Rajputs of Bundi and Mughal Emperors Akbar and Aurangazeb. Mughal Emperor Shah Alam gifted it to Maharaja Sawai Madho Singh I of Jaipur in 1754 and since then it was maintained as the hunting preserve of the Maharaja. Queen Elizabeth II and the Duke of Edinburgh were part of the royal hunting parties who stayed here. Air: Nearest airport is Jaipur is 165 km. Regular flight services are available. Rail: Nearest railhead is Sawai Madhopur. Good train services are available. Road: A good network of Bus services connects the place with major destinations. Local Transport: Unmetered taxis, auto-rickshaws, cycle-rickshaws and tongas. Ranthambore Fort: Dating back to 994 A.D., this well-preserved imposing fort is perched atop of a hill at an altitute of over 200 meters amidst a dense forest. 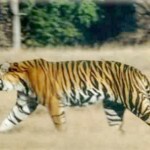 Ranthambhor National Park: Situated 12 km from Sawai Madhopur. 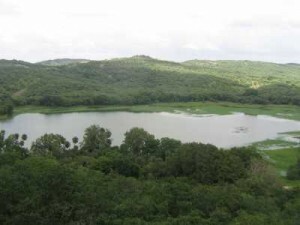 The park is one of the finest tiger reserves in the country. 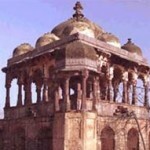 It was once the private hunting reserve of the Maharaja (King) of Jaipur. This entry was posted in Rajasthan, Sawai Madhopur and tagged madhopur india, Ranthambhor National Park, Ranthambore Fort, sawai madhopur district, sawai madhopur map, sawai madhopur ranthambore. Bookmark the permalink.